The S.Pz.Sp.Wg. (7,5 cm) Sd.Kfz.234/4 "Pakwagen" (Full name: Schwerer Panzerspähwagen 7.5 cm Sonderkraftfahrzeug 234/4 Panzerabwehrkanonenwagen) is a gift Rank II German tank destroyer with a battle rating of 3.0. It was introduced during Update 1.69 "Regia Aeronautica" in the "Operation S.U.M.M.E.R." event of 2017 that lasted from 28 July to 28 August, unlocked after obtaining 7 tanker Marks of Distinction. The Sd.Kfz.234/4 is easily picked out by its long gun and gun shield. If recognized, the enemies will see the vehicle as an easy target (in high BR's), but also as a deadly priority target! This armoured car is a lot of fun to play. The long 75 mm gun and the 234 chassis work very well hand in hand. The best way to play this mini-beast is to get on the enemies flanks as fast as possible (terrain permitting) and hide in the bushes. Take shots with hit probabilities, but hold fire more uncertain hit chances. Remember that the 234/4 can be and will be torn up by 12.7 mm machine gun fire, assume the position has been spotted after firing and move out via reverse. Do not engage in a straight-up gun battle or the 234/4 becomes scrap metal. The 75 mm gun is strong enough to destroy most tanks with one hit, meanwhile the 234/4 has a great speed of 30-40 km/h forwards and backwards to relocate. Because of this, it is possible (though not necessarily needed) to use the 75 mm and return fire while making haste. Terrain foliage such as bushes are great assets for concealment, shadows as well so use them and stay hidden. Wheels provide 10 mm of armour thickness. The best way to deal with this tank is to catch it out of position and/or from behind. Because of its low armour values, it can be easily penetrated with 12.7 mm Mg fire or HE shells to the open roof. Most AP and APHE shots will simply over-penetrate the vehicle's front armour and will not do much to the crew compartment unless aimed at specific crew locations or it hull-breaks the Sd.Kfz.234/4. As such, explosive ammunition or machine gun fire are the more preferred methods of elimination. The blitzkrieg tactics in Poland and France gave the Germans a new appreciation of mobile and lethal reconnaissance vehicles. The Germans especially valued the armoured cars due to their speed, firepower, and their pre-war build-up as they were not restricted by the Versailles Treaty. The Germans started with armoured cars like the Sd.Kfz.231 family, each with different armaments. However, these vehicles had its flaws and in August 1940, Germany sought a replacement following the conclusion of the Battle of France. The new vehicle was built off an improved Sd.Kfz.232 chassis made in monocoque construction by Büssing-NAG, its armoured body was made by Deutsche Edelstahlwerke, the turret by Daimler-Benz and Schichau, and air-cooled diesel engines by Ringhoffer-Tatra-Werke AG. The monocoque chassis design was built with an eight-wheel steering system, six forward and reverse gears, as well as having an additional driver seat in the rear for quick reversal get-aways. This construction led to Sd.Kfz.234 family. Vehicle construction first started in 1943 as the Sd.Kfz.234/2, which had a turret originally intended for the VK 1602 Leopard mounting a 5 cm L/60 gun, construction continued on this vehicle until mid-1944. The Sd.Kfz.234/2 earned the nickname "Puma" from the soldiers using it. Production for Sd.Kfz.234/2 shifted towards other armaments in 1944 that replaced the original. This produced variants such as the Sd.Kfz. 234/1 which replaced the turret with an open-top one carrying a 2 cm KwK 38, this was produced between mid-1944 to early 1945. Right besides that, the Sd.Kfz.234/3 was produced with an open-top structure to mount a 75 mm howitzer, this was produced from mid-1944 until the end of 1944. At the Sd.Kfz.234/3's production end, it was replaced by the Sd.Kfz.234/4, also known as the "Pakwagen", that had the armament replaced by a 7.5 cm PaK 40 anti-tank gun. This last variant was produced from the end of 1944 to the capitulation of Germany in World War II. A total of 478 Sd.Kfz.234 armoured cars were produced, 200 of the 234/1, 101 of the 234/2, 88 of the 234/3, and 89 of the 234/4. The Sd.Kfz.234 cars were originally intended for the conflicts in North Africa. However, the engine development took abnormally long to complete and by the time it was ready, the North African theater had concluded. Nevertheless, they served in the Western and Eastern front with success, but was impeded by its low production count. The Sd.Kfz.234 first saw combat in Normandy after D-Day in the stationed Panzer Lehr and 2nd Panzer Division in the Sd.Kfz.234/2 variant. 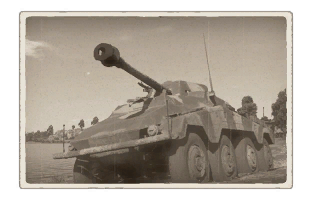 The divisions used these vehicles in recon roles until their withdrawal behind the Seine River, with Panzer Lehr having 8 Sd.Kfz.234/2 of the original 26 it had. These divisions were rebuilt in the fall of 1944 with the Sd.Kfz.234/1 and Sd.Kfz.234/3 after the 234/2 ceased production. This page was last edited on 30 March 2019, at 20:12.